You know how you can pull one small thread and a whole sweater unravels? That’s a bit like what my experience was in researching Marie Wetherill Schlesinger. I started and couldn’t stop. In my earlier post about the Schlesinger family, I wrote that I was disappointed that I had not been able to find any information about the background of Cousin Marie, the woman who married my cousin Joe Schlesinger and who cared for his mother Brendena for many years even after Joe died. She was a kind and loving person, according to my father, and she lived until she was 93, dying in Bradenton, Florida in 1981. 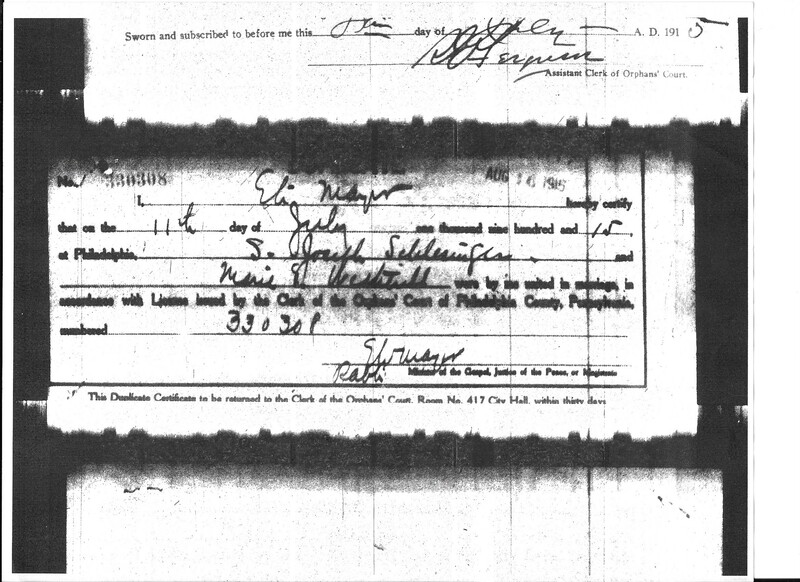 The only possible document I’d found about Marie from before she married Joe was a birth record listed on FamilySearch for a baby girl born in Philadelphia on August 15, 1888, the same place and date that Marie was born. 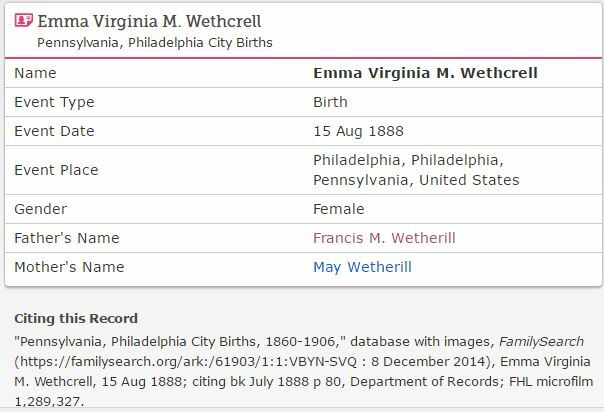 That baby was listed on FamilySearch as Emma Virginia M. Wethcrell, but her father’s name was Francis M. Wetherill, making me think that “Wethcrell” was a mistake in transcription by the indexer. The baby’s mother’s name was listed as May Wetherill. I had speculated that the M in the baby’s name might have been for Marie or Maria (some documents from after Marie’s marriage to Joe spell Marie’s name as Maria). 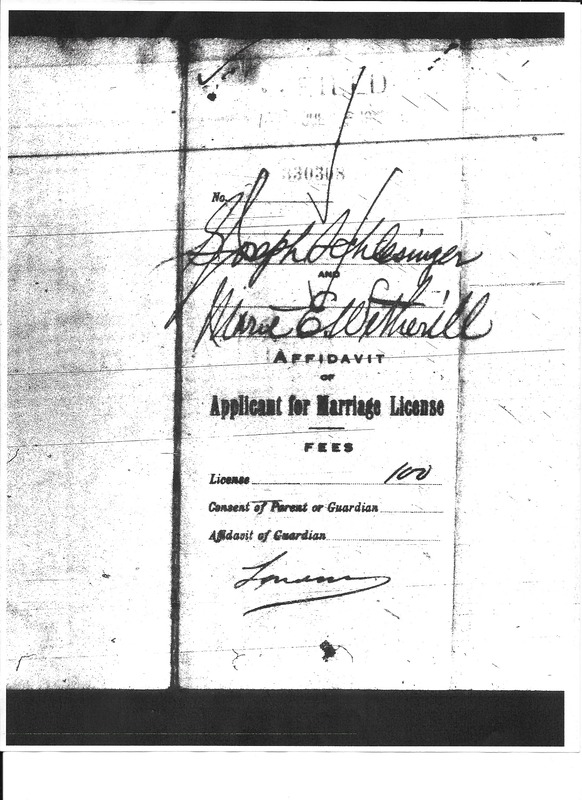 I thought that perhaps the actual birth record might have more information; I also wondered if the marriage certificate for Joe and Marie would include more information about her parents’ names. I went to the Philadelphia genealogy group on Facebook and asked for advice on obtaining copies of the actual documents. I was very, very fortunate that a member named Jo Schwartz volunteered to go to the city archives in Philadelphia to obtain copies. 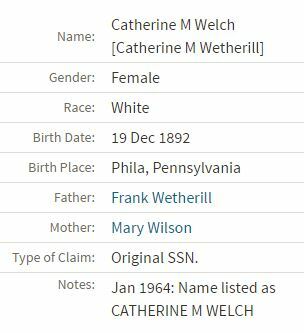 This had to be Marie’s sister—Catherine Wetherill Welch. The parents’ names were the same, and she was born in Philadelphia four years after Marie. Further research revealed that Catherine Wetherill married Talbot Welch in 1915, that, like her sister Marie, Catherine had not had children, and that, like Marie, she had died in Bradenton, Florida in 1981. My guess is that Catherine and Marie, both widowed, were living together in Bradenton and died within months of each other. I figured it would be easy to find Marie on the 1900 and 1910 census records now that I had the names of her parents and sister. But I was wrong. I focused first on Philadelphia since both Marie and Catherine had married men from Philadelphia and both had married in Philadelphia. 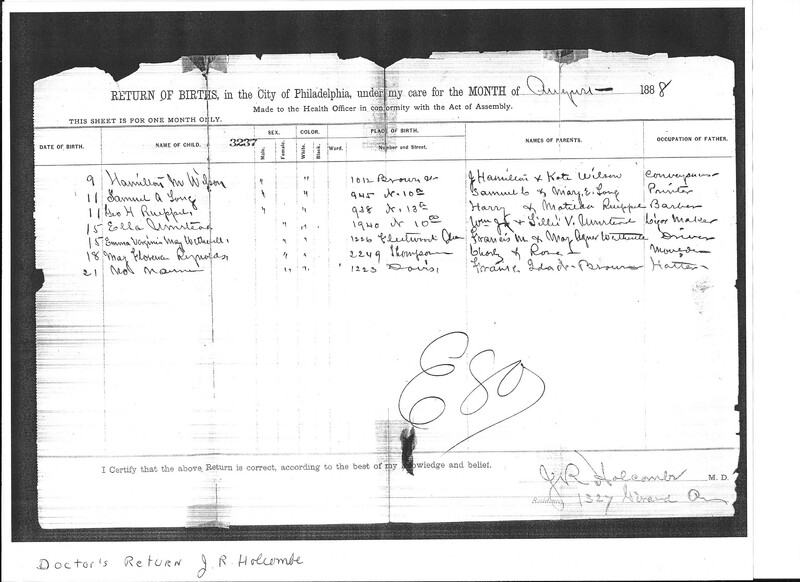 I could not find a Francis or a Frank Wetherill on the 1900 census in Philadelphia. I did find a Francis M. Wetherill in several Philadelphia directories, but he was a student in 1895, and that made him too young to be Marie’s father. I also found a Frank Wetherill in a Philadelphia directory, but when I found him on a census based on the address, it was not with the same family. 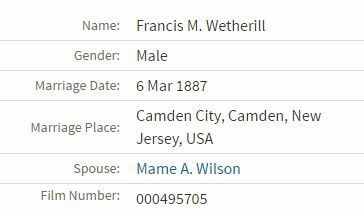 Then I found a marriage record for a Francis M. Wetherill and a Mame A. Wilson who were married in 1887 in Camden, New Jersey. Camden is right across the river from Philadelphia, so this seemed a likely match for Marie’s parents. Maybe Mame was a nickname for Mary or vice versa. Maybe that’s why that birth record said May. At any rate, I decided to search Camden as a possible residence, but still came up empty handed for 1900. Ancestry.com. New Jersey, Marriage Records, 1670-1965 [database on-line]. Lehi, UT, USA: Ancestry.com Operations, Inc., 2016. But, boy, this census report was confusing. The head of household was Mary Ann Smith, an 81 year old widow. Next listed was her daughter Annie Wilson, a 52 year old widow, and then Mary Ann’s son, Jerry Smith, age 49 and single. Annie listed that she had had four children, two of whom were still living. The fourth person in the household was a 30 year old woman named Mamie Wetherill; this seemed like it could be Marie’s mother, who had been listed as Mame A Wilson on the marriage record with Frank Wetherill in 1887. On the 1900 census, Mamie is listed as Mary Ann’s granddaughter. Since I knew that Marie’s mother’s maiden name was Wilson, I figured that Mamie was Annie Wilson’s daughter and thus Mary Ann Smith’s granddaughter. 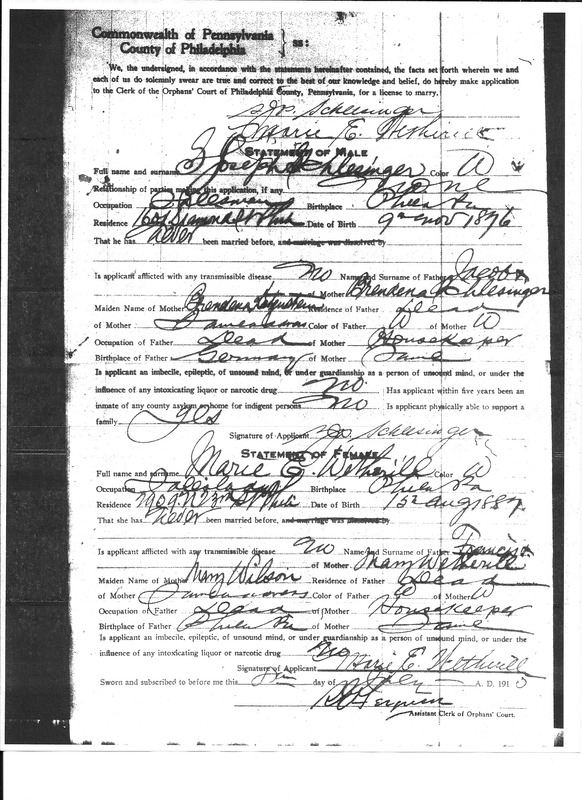 Although Mamie listed her status as married, there is no husband listed as living in the household. Mamie reported that she had had four children, four of whom were still living. Not one of the adults in the household listed an occupation on the census. There are then five children with the surname Wetherill listed after Mamie, but they are listed as the grandchildren of the head of household. This must be wrong; these are clearly Mamie’s children, given their ages and surname. They are the great-grandchildren of the Mary Ann Smith, the head of household. The five children are Frank (17), Marie (12), Florence (10), Katherine (6), and Harry (3). I had found Marie, and now I knew that by 1900 she was living with her four siblings, her mother, her grandmother and great-uncle, and her great-grandmother. But there were so many questions left to answer. Was her father still alive? And if her father was still alive, where was he? This entry was posted in Genealogy, Katzenstein, Philadelphia and tagged Bradenton, divorce, Florida, Philadelphia, Pierson, schlesinger, Wetherill by Amy. Bookmark the permalink. It really is so much fun, researching and then putting together the pieces! I noticed the birth certificates were more recent? Do they not have copies of BC’s that far back? If not how do they have the info you do receive? Just curious. It looked like the birth certificate info were up-to-date cards? I guess I’m asking why you couldn’t get a copy of the original? The birth record is there—there probably wasn’t a certificate, just the registry you see there. Leaving us hanging again, Amy? I would have done the exact same search for Catherine to find the family. The 1900 census – I don’t know if the times were changing – is one where I have found several women listed as married and the husband is missing. I’m curious to see if you found for this family one or the other scenarios I’ve run across. And I am curious as to your reaction to what I think I found… Thanks! Amy, part of the reason I enjoy your stories so much is that you share your research process, and what goes through your mind as you are looking! Thanks, Janice. I like sharing my process so that I myself remember how I found things and my own analysis. Also, so others can tell me where I’ve gone wrong! And maybe it will help someone else figure out their own research problems. You’ve inspired me to get my shovel out and start digging again for my Rose Rosen m David Smith, lol….great post Amy! It’s not been a good day, so I am a little confused. So Francis was NOT her father? That was a red herring? Sorry . . . .
On another note, is it just me or is that handwriting on the marriage certificate just WILD? Oh, dear, I hope you are okay. I’ve been out all day, so am slow in responding. Francis WAS her father—the question is—what happened to him? More in my next post. The handwriting was quite difficult to decipher, and I think someone had a leaky pen! Oops! I knew I had to be wrong. Tomorrow is another day. Was the post unclear? Maybe I need to clarify something there? Hope today is a better day! Was it or it is me? I think it’s when you said you were searching for her with the wrong family that made me leap to the conclusion that maybe it wasn’t Francis after all. Ugh. Don’t listen to me. Hi Cathy–thanks for reading and commenting. And also for you kind words! I hope I am helpful—it’s one reason I explain how I find things and make inferences. Please feel free to ask if you have questions! Always glad to help if I can. I’m with Janice. I love the way you share your thinking and research processes, especially as I’m working with different record sets and different constraints in my own research. Great sleuthing as always; I can wait for the next installment. Thanks, Su—I know how much I always learn from how others do their research and reasoning, and as I commented to Janice, it also helps me remember how I reached my own conclusions! I like how you searched for the surname in a certain date range – I hadn’t thought of that. Thanks for the tip. And glad you found her. Glad you find it helpful. I know that so much is trial and error as I go along, so I try to keep track of what worked…for the next time! Thanks!